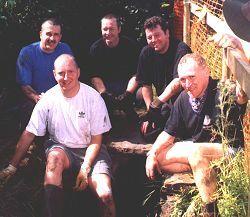 Although always "poised at the ready", Marple's Active Volunteer Initiative Squad had not been called into service since pulling the foundation stone from the River Goyt in May 2000. We were therefore delighted to be able to rise to a new challenge offered by Ann Hearle during the summer of 2001. As most local visitors to the site will know, Ann is the Local History Society Chairman lucky enough to have discovered 10,000 years of history in her own back garden at the Old Vicarage in Mellor, where for the last three years archaeologists have been excavating the most amazing finds. For those of you who don't already know about this, take a look at the Mellor Dig pages and get down to one of the Open Days. The gun found during a previous visit. 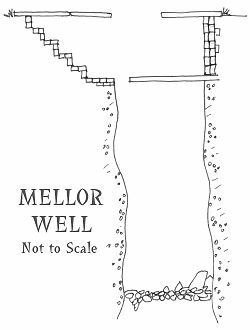 The challenge thrown down by Ann was to excavate the silt and debris from the bottom of the well at Mellor and bring it to the surface so that the archaeologists could sift through it, hopefully to discover all kinds of interesting artifacts that had found their way to the bottom. As the well is within the perimeter of the iron age fort discovered at Mellor, things could have been dropped down there for hundreds, if not thousands of years, just waiting to be discovered. The only person in living memory known to have gone down the well is Ann's son several years ago and he came up with a Thompson Sub-machine gun placed there by the Home Guard during the last war! More of that later. The Mellor well is a rectangular shaft of approximately 4' x 6' and around 20' deep cut through solid rock. There are drill marks on the walls which are presumably relatively modern but these could have been made during widening of the shaft, rather than when it was first constructed. Maybe the well was originally just a natural fissure in the rock. At the top of the well is a chamber lined with stone with steps descending to a large slab approximately 5' below ground level. This slab covers the shaft except at the bottom of the steps, where it has a narrow curving slot just wide enough for a bucket to pass down or a man to squeeze through. The steps and the whole of the well are now covered by stone slabs to prevent people or livestock from falling down it. The well could have been modified and improved over a long period of use and as a result it is difficult to say how long it may have been there. Perhaps if we can get to the bottom of it we will discover enough clues to help the archaeologists give us a better idea. Peter and I arrived early and after moving the large stone slabs covering the well entrance, the task appeared rather more daunting than we had anticipated. Instead of water and several inches of silt as we had expected, it appeared that someone had chucked a dry stone wall down the well and there was no water to be seen, just a huge pile of rocks about twenty feet down. We actually considered throwing the towel in immediately but thankfully MAVIS is made of sterner stuff than that! Once the "muscle" arrived in the form Jon Bintliff, Jeff Boland and Rob Gall, all full time Firefighters at Marple Fire Station, fairly short work was made of shifting the first layer of rocks using a rope and bucket. After the first foot or so of rocks were removed, water was exposed and before much longer it was creeping towards the tops of our wellies. It was then that the first handful of live bullets was revealed, to be followed by more and more until we had nearly a bucket full of live World War II ammunition. There were two different types, most appeared to match the sub-machine gun found years earlier but there were also some larger calibre rounds that were similar to those used in Officer's pistols during the First World War. maybe there's one of those down there but we didn't find it today. Numerous bucket loads of rocks, muck and bullets followed, keeping the archaeologists busy. By lunchtime water was starting to flow over the rim of our wellies and we were bent double with water to our armpits. The number of bullets were making the archaeologists slightly nervous, although not as nervous as the large frog he discovered down the well was making Rob Gall. We decided to call it a day but agreed that it had been interesting enough to return again and see what would be revealed if we could get rid of the water (and frog) to excavate deeper. We wanted to come back the following weekend but Rob seemed to think that the fact he was getting married would probably have to take precedence. These youngsters are all the same! Armed Police Raid Mellor Old Vicarage! Not knowing what to do with the large bucket of live ammunition collected from the well, Ann contacted the local Police to enquire about disposing of it safely. Initially they were a little perplexed but eventually agreed that they could do this. Having negotiated this hurdle, Ann decided to mention the Thompson Sub-machine gun. This was less well received and within 10 minutes three Police Land Rovers and six policemen (including a Tactical Armed Response Unit!) had descending on the Old Vicarage. 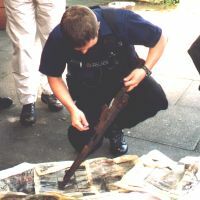 Fortunately after examining the gun, which is so rusty there is no risk of it ever being fired again, the Officers allowed Ann to keep it. Can archaeology get more exciting than this?